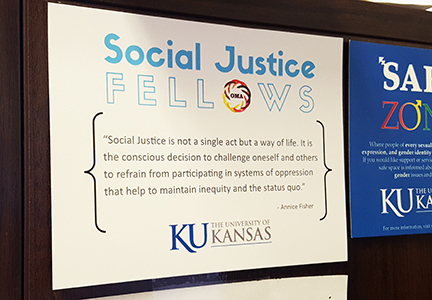 LAWRENCE — The University of Kansas Office of Multicultural Affairs is accepting applications for the 2018 cohort of the Social Justice Fellows Program. Now entering its third year, the program provides intensive direction to faculty and staff on issues of social justice, inclusion and systemic oppression. The program is structured like an academic course with scholarly readings, discussions and short reflections. Social Justice Fellows launched after the November 2015 town hall on race, respect, responsibility and free speech. Leaders at OMA received numerous requests for education and training surrounding cultural competency, inclusion and social justice issues. The fellows will meet for two hours, twice a month during the spring semester and complete extensive reading assignments outside of meeting times. The rigorous experience requires fellows to conduct a critical examination of themselves and their role in systems of oppression with the goal of developing skills to advocate and create systemic change. The readings complement self-exploration and create a baseline of social justice knowledge. This year, organizers are asking participants to pay a $50 fee that covers costs associated with programming, guest speakers and materials. No applicants will be turned away because of inability to pay. About 60 faculty and staff have completed the program to date. The OMA has called upon fellows to assist with the demand for training throughout the institution. The fellows work in several offices and units at KU and found the program challenging, informative and motivational. Mehmedovic acknowledged that the benefits of the program were also accompanied by the discomfort of self-discovery. The OMA is selecting applicants for membership in the spring 2018 cohort. About 35 individuals will be chosen to participate. Faculty and staff who are interested in participating should apply online by Dec. 8. Selected participants will be notified before the end of the fall semester. Michelle Wilson, Achievement & Assessment Institute.